Decided to do a different take on Randall Taylor-Craven's 3-D Zendala. It was in preparation for doing the 3-D Zendala. I also was curious what it would look like if you used different colored tiles. Did not get pictures of the ones from the class. This is the one that I did. This is labor intensive in that you do a lot of tangling. Here are pictures and I will type more after the pictures. This is only 4 layers. 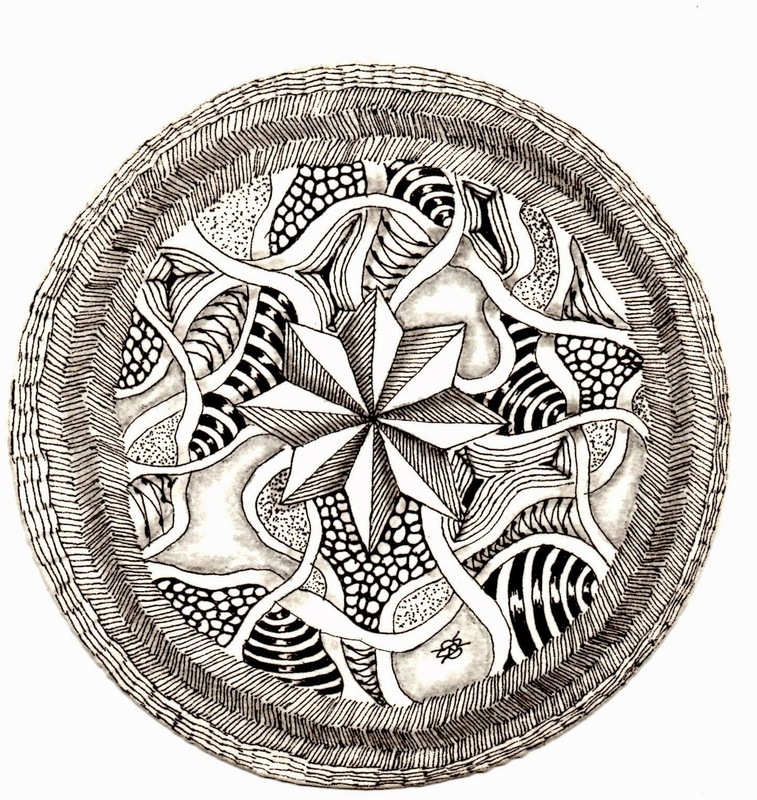 The largest one is a full size original Zentangle® tile. The next is a Renaissance tile with about an inch cut off. Did this by measuring in from the corner and then connecting the corner dots like you would make a border on a regular tile. The next is a Bijou tile. The last is about a ¼ of a full size black tile. The ones that were cut, I used as a template for the second one. I did not tangle the whole tile except for the black one. I arranged them on the tiles and traced lightly around the one on top. I then tangled just beyond this line. To keep them consistent, on both sides, I used The same one on both sides and put a small arrow on the back to indicate the top of each tile. This helped when I was putting them together. The last step was using the double adhesive foam circles to put it together. I used the circles and them cut them in half or quarters depending on the size of tile I was using. This week's challenge is to use materials or tools that you do not usually use. Is a lot going on and was not even sure that I would have a chance to do something. Took a few moments last night and did something quickly. What I chose to do was use a new tool. When I did the ZAP program last fall I received a package of things from Sakura. One of the items was a set of Koi watercolor brush pens. I have never used them. Thought this would be the perfect opportunity to pull them out and see what could do. As I usually use the Microns was a challenge to keep some consistency with the brush tips. Did not turn out too bad except for the flux. Got a little heavy handed. Here is what I came up with. I hope you enjoy it. Not using my compuer, plus this is a scan, so took a while to get the picture so it was able to be seen. Not exactly the best, but cannot devote any more time to it. I have not looked at what others have done. Maybe able to get to it later. If you have not, would encourage you to do so by going to I am the Diva and looking at all the art. This may be the only post that I get done this week. I was intrigued when I saw the template. I had an idea of what I wanted to do. I just was not sure exactly how to proceed or how it would turn out. I wanted to use the sections in the template as negative space. I did accomplish that. I am generally pleased with the results of the Zendala. The highlighting with the white pencil did not turn out as well as I would have hoped. I do not remember it being a problem before as I had used colored pencils on the Renaissance tiles before. The paper seemed to break down when I tried to do any blending. Was frustrating. Here is what I came up with. I hope you enjoy it. Tangles used: Vache (variaiton), Stripes, The rest is just line work. Shading/highlighting done with colored pencils, Prismacolor white pencil, and 4B pencil. The colored pencils was a mixture of pencils. I have not had a chance to look at many of the things that have been posted on The Bright Owl. Would encourage you to take a look and check out her giveaway. You may want to try it yourself, even if you do not post. After a significant absence Erin at The Bright Owl has again started to post the Zendala Dare. She posted one last week, but I was unable to get anything done for that. Before I was pretty regular in posting Zendalas. I like doing them but after not doing them with template for a while, it took a little time getting used to doing them again. This is an interesting template. I do not remember one quite like this before. There were probably a number of directions one could go with this. Here is what I came up with. I hope you enjoy it. Shading was done with #2 pencil. I have only seen Erin's Zendala. Hope to look at a few of the others. If you are not familiar with the Zendala Dare, go to The Bright Owl and look at what others have done. Give it a try yourself. The focus tangle on Square One this week is Huggins. I do not use this a lot. Am more likely to use Cadent. For some reason, getting the lines in the right direction is more challenging on this one. I have to concentrate more on that then just the stroke. The rest of the tile came together rather easily, after some early brain freezes about what to do. Once I started it flowed fairly well. Here is what I came up with. I hope you enjoy it. Shading was done with a #2 pencil and stippling. Was not sure that I was going to get anything done this week. 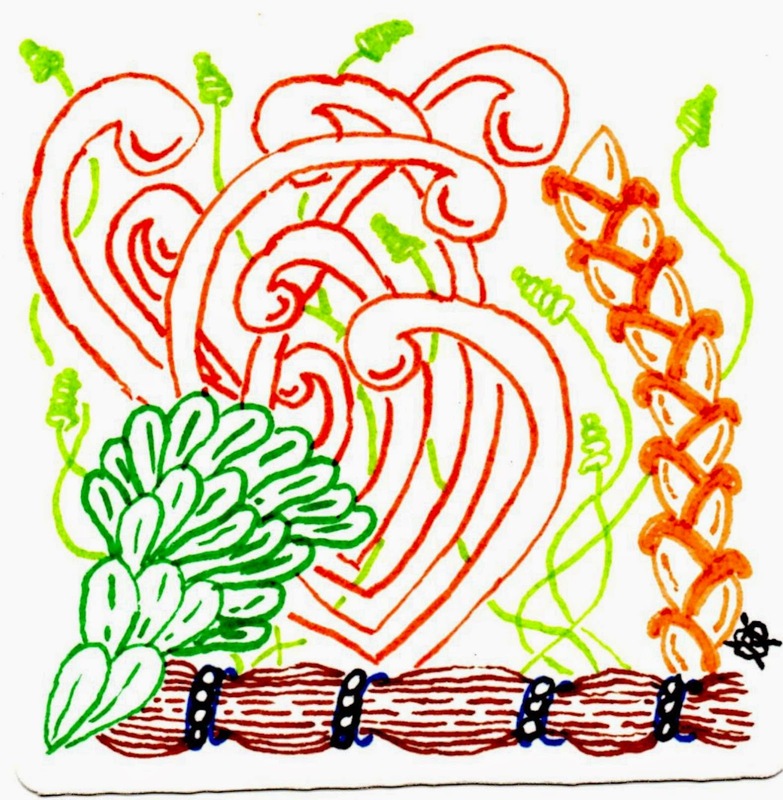 I like this tangle and enjoy playing with it in a free form ala Helen Williams style. You can see her work at her blog a little lime. Thought about doing a monotangle but decided to add a few other things. This one was fun to do. Here is what I came up with. I hope you enjoy it. Have been busy most of the week with family things. Have not had a lot of time to do much tangling. Was not sure if I would get anything done for this challenge. I finally decided that I needed the time to unwind because of all the things going on. It was my way to take care of myself. This week's challenge is a Use my Tangle challenge. This is an unusual tangle and like Margaret Bremner, think of it more as a technique, but it can have dramatic results. The results on Seven's blog are a good example of this. You can click HERE to see her stepout and examples. I did not have a lot of time to play with this tangle so I kept it simple. Not totally thrilled with the results but also not totally disappointed either. Here is what I came up with. I hope you enjoy it. Tangles used: Athitzi, Hollibaugh, Gneiss, Betweed, Tipple, & Stripes. Not sure the others are tangles. One is stippling and the other is auraing the shape. Not sure how much time I will have to look at the other things posted. Would encourage you to do this as most people who post appreciate the views and the comments. You can access the Diva's blog here. Try it yourself too, if you "dare". The Square One focus tangle this week is Quandary, or Quandry, depending on who is spelling it. I was pleased with this choice as this is the tangle that was first introduced at my CZT seminar. From comments from people this is a tangle that people either like or they have serious issues with it. I admit that at times it can be challenging. Usually I find it so if I try to make the rice kernels too close together. There are a few wonky ones in there as well a couple of times where I only had 5 kernels. Another reason that I like this tangle is there are numerous ways to embellish it. That being said, I decided not to do that with this tile. Here is what I came up with. I hope you like it. I wanted to try something a little different with this one. I had seen other tangles within tangles before but do not think I have tried it before. As is usually the case, the image that I had in my head is different than what ended up on the tile, but that is not a big issue. Hopefully I will have some time this week to try some other things with this tangle. If you have not tried this tangle before, I would encourage you to give it a try. Don't give up on it. See how may different ways you can finish it.